The RC-28 utilizes the same tuning knob and encoder used on Icom HF radios, providing a tactile option for the RS-BA1 software. Includes a sturdy PTT and two user-programmable function keys. 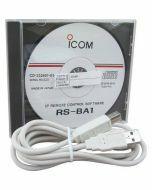 The RC-28 is not a standalone control for Icom radios and may only be used with the RS-BA software.